Goat at Freshkills Park, 2012. As invasive species become a greater problem and harder to deal with, New Yorkers are looking to more creative solutions to control their presence. Parks in the area incorporate a wide array of methods to control invasives including manual removal, pesticides and even controlled burnings. But one proposed method takes a more sustainable approach; the incorporation of goats into natural landscapes to graze on these unwanted plants. 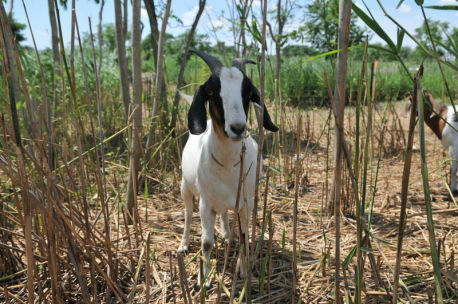 Freshkills Park also hosted goats in 2012 during a two-acre wetland restoration project. The goal of the Main Creek Wetland Restoration was to provide guidance for further wetland restoration projects within the 2,200-acre site. The pilot project has been monitored for success in phragmites eradication and reintroduction of native plant species. Contracting goats is increasing in popularity and for good reasons. Goats can consume up to 20% of their body weight daily, and will consume the difficult to remove, non-native plants. They have been shown to eat and weaken phragmites, a tall weed that chokes out other vegetation. In addition they consume goutweed, poison ivy and other invasive weeds that are a nuisance to get rid of. A recent study by Duke University has shown the effectiveness of goats in reducing phragmites abundance. Their experiment showed goats can reduce phragmites cover as much as 80% and over time, phragmites that grow in goat grazed areas grow shorter, with less stem density and with significantly less coverage. With their proven success in managing weeds, more and more parks are moving away from high cost eradication to sustainable goat grazing. Goats are becoming more and more commonplace in NYC’s parks. They are cost effective, sustainable, work around the clock and can reach areas difficult for park workers to access. With goats constantly present, park workers can spend less time and effort on invasive removal and focus their attention elsewhere. Another upside is they don’t require fossil fuels to operate like most weed managing equipment. They are fueled directly by the plants they are removing. 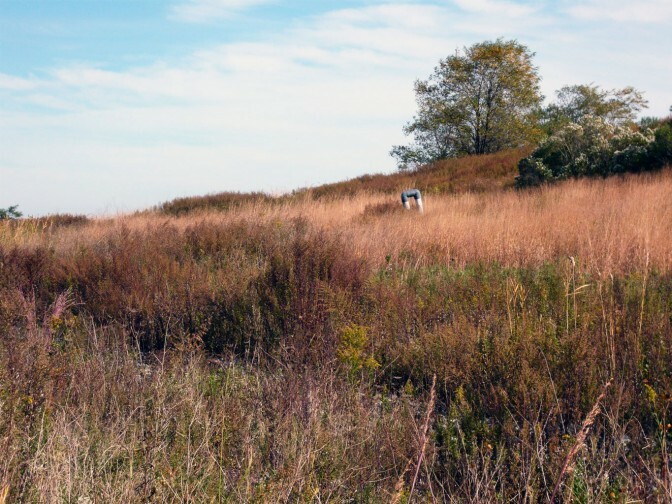 Goatscaping is just one of the ways Freshkills Park is working to combat phragmites. UnCommon Pages, a bookmaking project led by Artist Susan Mills, makes paper sheets from the invasive plant. These sheets are the cover stock for 2,000 passport-sized Field Notebooks, in the process of being made by workshop participants in an ongoing series of workshops.